Anderson Franco, MaryKate Brouillet, Katie Tyler, and Jace Franco in Peter Pan at Toby's Dinner Theatre. MaryKate Brouillet in Peter Pan at Toby's Dinner Theatre. The full company of Peter Pan at Toby's Dinner Theatre. Actor MaryKate Brouillet, appearing in Peter Pan at Toby's Dinner Theatre. 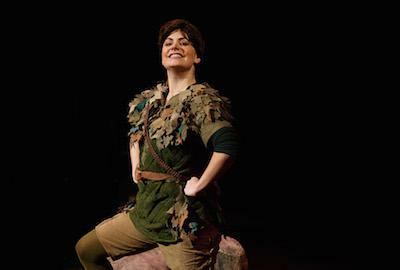 For this month’s Art of the Actor, MaryKate Brouillet shares the playful approach that keeps J. M. Barrie's beloved story fresh and magical for children and adults alike. 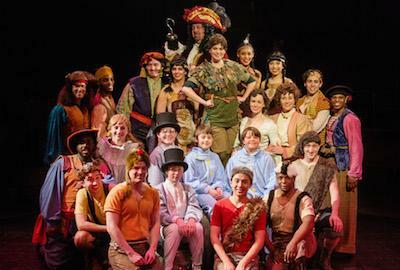 You can see the results in Peter Pan at Toby's Dinner Theatre through June 12. I started as a singer. My mom is a music teacher – she was my music teacher in elementary school—and I’ve always loved to sing. When I was ten, there were auditions for Annie at the local high school and so I went and got a role as an orphan. I played July. Ever since then, it’s always been a part of my life. For me, at least right now, it’s being able to move people—having an impact on people, giving them something to remember after every performance. For this show in particular, it’s making children believe in something magical, and for the adults and older generations, too. [Peter Pan] was such a huge part of their lives with the Mary Martin version in the fifties. I think it would probably be the job – landing the gig. Those periods of being out of work. It’s unsteady and that can be challenging and scary for everyone. I think also challenging yourself—making you break your limits and finding things that make you uncomfortable and overcoming that which in the end is rewarding, of course, because you learn more about yourself and what you’re able to do. Tell us about playing Peter Pan at Toby’s. How do you keep this role fresh when it's so iconic in people's minds? What did you do to make it uniquely yours? Really just letting go and having fun. The role is an excuse to be fun and carefree and to let go of the restrictions that I would normally put on myself. I keep it fresh by playing—playing with the Lost Boys, playing with the Darling children—and that way we’re always able to make new discoveries. It’s a good cast and a good group of people who keep it fresh by just playing together. I think it’s probably different for everyone and it can change. The art of the actor is telling the story—doing the piece justice by telling it truthfully and honestly and doing it in your own way. Being able to tell the story to get the message across and making people believe you; finding elements of yourself to bring to the character and to the story that make it fresh and uniquely yours. People come to the theatre to see art and we’re performing art, so [the art of the actor] is capturing people and bringing them on that journey with you in a believable way. It’s work. It’s hard work. It’s not all playing make-believe; it requires a lot of research, a lot of homework and dedication and self-preservation. Taking care of yourself is a full-time job. Challenging yourself to grow is a full-time job. This was an unexpected role for me. I dreamed of it but I never thought it would actually happen. This role is something I grew up loving—watching the Mary Martin version. Peter Pan has always been very magical and very close to my heart. It’s been an unexpected blessing for me. 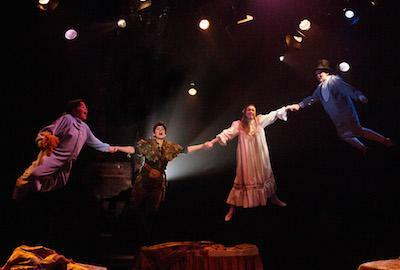 Don't miss Peter Pan at Toby's Dinner Theatre through June 12.